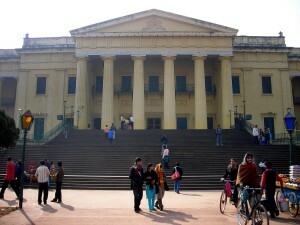 Hazarduari, also known as the Hazarduari Palace, is the main tourist attraction in the Murshidabad district, West Bengal. The distance from Kolkata, the state capital is around 219 km by roadways.You canalso reach there by train. Hazarduari, which means the palace with thousand doors, is the artistic creation of Duncan McLeod, the well-known British military engineer. The construction work of the entire palace took nine years and the whole palace was built with Italian marble. There are three floors and about 120 rooms in the palace. 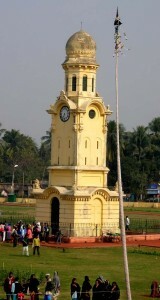 It is situated at Lalbaagh at around two and half kilometers from the Murshidabad Railway Station. You will get to see a number of objects used by the Nawabs including chandeliers, silver throne and old-fashioned furniture here. The approximate size of this place is 825 * 200. There is an unmistakable strain of Gothic artistry in the whole palace. Very strangely, though it is known as the palace, the Nawab actually did not live here. However, the Nawab used to grace the throne made of silver here under a large chandelier (with 161 individual chandeliers or jhaarbaatis in them). This chandelier was given as a prize by Queen Victoria. Previously, the name of the palace was Bara Kothi and it lies inside the compound of Kila Nizamat in Murshidabad, West Bengal, India, on the riverbanks of Bhagirathi. The Kila or citadel was dismantled for constructing this magnificent palace. The construction work commenced in the year 1829. This was when Nawab Nazim Humayun Jah was the ruler of Bengal, Bihar and Orissa (1824–1838). Around 17 lakh rupees were spent for this. On August 9, 1829, the foundation stone laying ceremony was held, and the building work began on that particular day. At that time, the Governor-General of Bengal was William Cavendish. 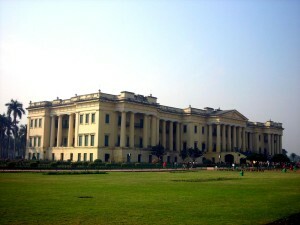 At present, Hazarduari Palace is the most prominent edifice in Murshidabad district. The Archaeological Survey of India took up the responsibility of preserving this architectural wonder in 1985. Out of 1,000 doors of this imperial mansion, only 100 are genuine and the rest are false. The palace is rectangular in shape and 80 feet tall. Of late, the palace has been converted into a museum which is home to collected objects and artifacts of the Nawabs such as precious paintings, age-old objects, furniture, and so on. The chandelier (the biggest after that in the Buckingham Palace), the palanquins etched from elephant tooth and the mirrors (the hide and seek mirrors of the room where crucial discussions were held at the palace) are the most known ones. The museum in Hazarduari Palace is considered to be the largest site museum of ASI. It features 20 exhibited art galleries which include 4742 artifacts surviving from the past. Of these, 1034 have been exhibited for the common visitors. The artifacts include portraits drawn by artists from the Netherlands, France and Italy, different artilleries, marble sculptures, figurines made of ceramic and embellished with stucco work, furniture made of mehagony, articles made of metal, farmans, old maps, holographs, uncommon books, land revenue documents, a bamboo from Assam, palanquins predominantly seen in 18th and 19th centuries, and others. Gallery no 1 and 2: They are also named as Armory Wing A and B and are home to the arsenal. Gallery no 3: Houses the royal showpieces. Gallery no 4: It is also known as the landscape gallery. Gallery no 5: It is the British Portrait Gallery. Gallery no 6: Nawab Nazim Gallery. Gallery no 7: Durbar Hall. Gallery no 8: Committee Room. Gallery no 9: Billiards Room. Gallery no 10: The portrait gallery of the Nazirs and Dewans. Gallery no 11: Prince Portrait Gallery. Gallery no 12: Western Drawing Room. Gallery no 13: Archive Gallery. Gallery no 14 and 15: Periodical gallery 1 and 2. Gallery no 16: The Main Hall or Central Landing. Gallery no 17: Northeast Landing First Floor. Gallery no 18: Northwest Landing First Floor. Gallery no 19: Painting Gallery. Gallery no 20: Religious Objects’ Gallery. In addition, there is a library with restricted entry to the visitors. The art galleries feature paintings from famous painters including Van Dyck, Raphael, Titian etc. There is a wide range of oil paintings, clock collection, stone-statues to be explored here. Do have a look at the porcelain plates from China, used by the Nawabs. One of the most interesting features of these plates were they used break if there was poison in food. DO NOT book any guide for Hazarduari palace as the entry of guide is strictly prohibited. Photography is prohibited inside the palace. You have to deposit all your mobile phones or camera in their locker at the gate. This entry was posted by indispottravel in Historical Places in West Bengal, West Bengal and tagged Duncan McLeod, Gallery, Hazarduari, Italian marble, Lalbaagh, mehagony, Murshidabad, Murshidabad Railway Station, Nawab Nazim Humayun Jah, Nawabs, oil paint, Queen Victoria, thousand doors, West Bengal.